Washington, DC — Gun deaths outpaced motor vehicle deaths in 14 states and the District of Columbia in 2011, the most recent year for which comprehensive nationwide data is available, a new analysis from the Violence Policy Center (VPC) finds. In 2011, there were more gun deaths than motor vehicle deaths in the following states: Alaska,Arizona, Colorado, Illinois, Louisiana, Maryland, Michigan, Nevada, Ohio, Oregon, Utah, Vermont, Virginia, and Washington State, as well as the District of Columbia (see below for the mortality figures for each jurisdiction). Data is from the Centers for Disease Control and Prevention’s National Center for Injury Prevention and Control and is the most recent available to compare death rates from both products. This is the third year the VPC has issued its annual report comparing gun deaths to motor vehicle deaths by state. Gun deaths include gun suicides, homicides, and fatal unintentional shootings; motor vehicle deaths include both occupants and pedestrians. More than 90 percent of American households own a car while little more than a third of American households have a gun. 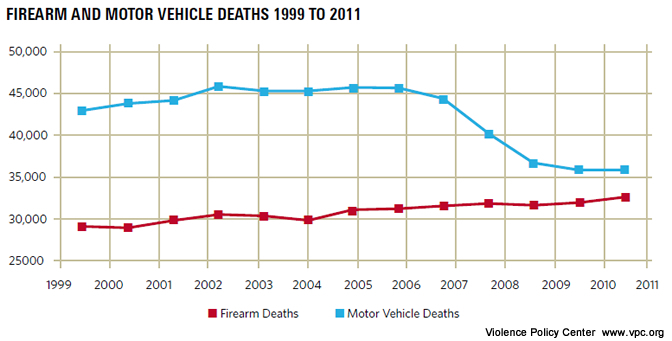 Americans’ exposure to motor vehicles vastly outweighs their exposure to firearms. Yet in 2011, there were 32,351 gun deaths and 35,543 motor vehicle deaths nationwide. In 1999, there were 28,874 gun deaths and 42,624 motor vehicle deaths nationwide. Firearms are the only consumer product in America not regulated by the federal government for health and safety. Meanwhile, motor vehicle deaths are on a steady decline, thanks to decades of public health-based injury prevention strategies and proven consumer product safety regulation standards designed to reduce death and injury. “We didn’t put up with a free-for-all on our highways, and it’s time to end the gun violence free-for-all in our schools and neighborhoods,” states Sue Hornik, executive director of States United to Prevent Gun Violence. The report includes specific recommendations on how the federal government should regulate firearms to reduce gun death and injury. To read the full report, please visit vpc.org/studies/gunsvscars14.pdf. States United to Prevent Gun Violence (www.CeasefireUSA.org) is a national non-profit organization working to support state-based gun violence prevention groups and help build new state-led organizations. States United believes that all Americans deserve to live in a country free from the fear, threat, and devastation caused by gun violence.